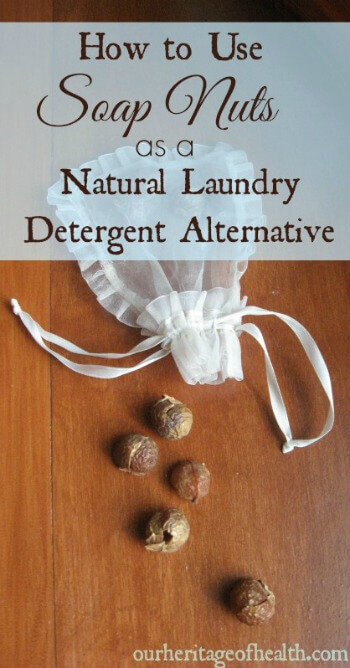 When I first heard about using soap nuts as a laundry detergent alternative, I liked the idea of using something that was natural and simple . . . but I was also pretty skeptical that they would actually work. When I tried them, though, I was pleasantly surprised by how well they cleaned my clothes. They worked just as well as any homemade or store bought natural laundry detergents I had tried, only they’re even easier to use and much cheaper too. Some of the homemade versions I’ve tried have been a little messy or complicated to use with separate mixes for washing and for a rinse cycle, but with soap nuts you only have to use one ingredient and there’s no preparation required. Soap nuts are much more economical, too. 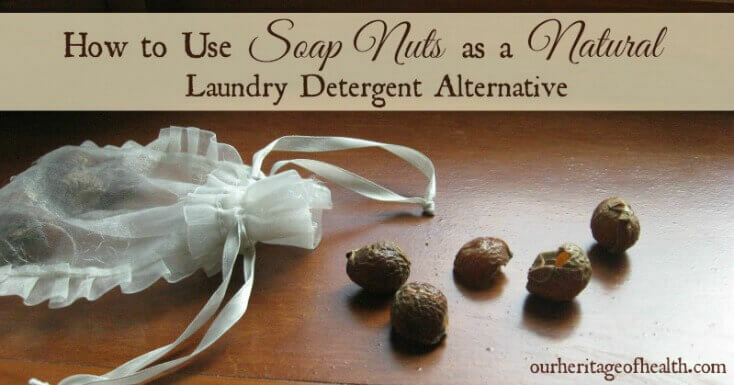 Many store bought natural detergents are fairly pricey, but one bag of soap nuts will last for many loads of laundry. I bought an 8 oz bag of soap nuts last summer, and I’ve only used about half the bag so far. So, What Exactly Are Soap Nuts? Even though they’re called nuts, soap nuts actually aren’t part of the nut family at all (which makes them fine to use even for people who are allergic to nuts.) They’re actually the dried berries from the Sapindus mukorossi tree, and they contain saponin, a natural sudsing agent when they’re in water. Where to Find Soap Nuts? They’re natural and non-toxic with no chemicals or synthetic fragrances. They’re simple – just one ingredient. They’re non-allergenic and good for sensitive skin. They’re really frugal – one small bag of soap nuts lasts for a long time. They’re easy to use. Just throw them in with your laundry and you’re good to go. They work with both soft and hard water. They’re eco-friendly and you can compost them when you’re done with them. to put them in. If you don’t, you end up having to pick through all of your dripping wet clothes to try to find the little soap nuts at the bottom of the washer. 2) You need to use about 5 soap nuts at a time, and you can re-use them about 6-8 times. What I usually do is to put 5 soap nuts in my drawstring bag and then just make a note on an index card I keep with my laundry stuff so I can keep track of how many times I’ve reused them. 3) All you have to do is to just add the drawstring bag with the soap nuts in with your laundry and let the machine do its work like usual. That’s it. Then, if you want to do a rinse cycle, just take the bag of soap nuts out first. I was very pleased with how the soap nuts worked to clean my clothes. They looked, smelled, and felt fresh and clean – just as clean as with any other homemade or store bought natural detergent alternative. Disclaimer: I should mention, though, that soap nuts work well to clean my regular, not-really-that-dirty clothes. I can’t say from personal experience that they would work equally well on children’s play clothes or work clothes, or anything that’s really filthy. One thing that I really like about soap nuts is that they don’t have any strong scent once the clothes are dried. When they’re wet, they have a slight vinegary scent to them from the soap nuts, but once the clothes are dried, they just smell like fabric without any noticeable scent. Even though I used to like using scented laundry detergents, now that I’ve switched to natural products, I find that the synthetic scents in most store bought laundry detergents have an overwhelmingly fake scent to them, and I like having my clothes smell just plain clean.